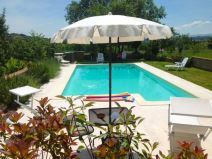 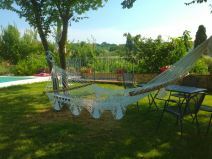 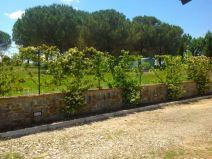 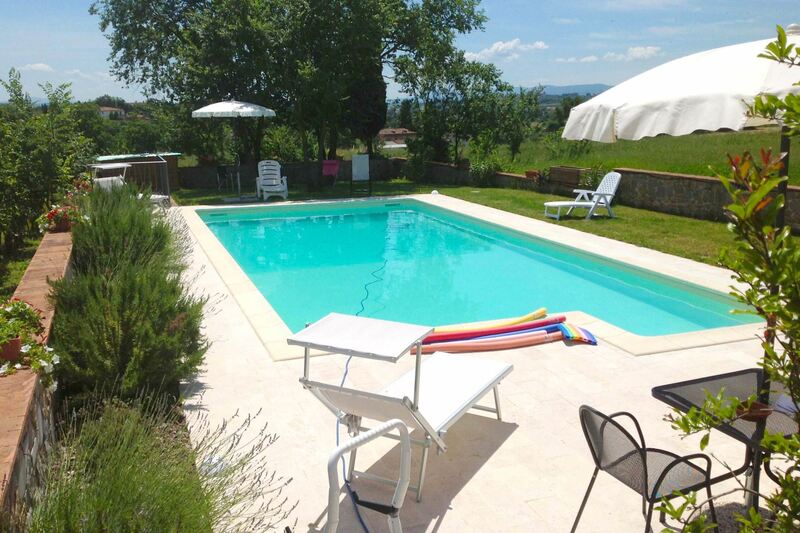 Portion of a country house with private garden and swimming pool, Wi-Fi access, satellite TV. 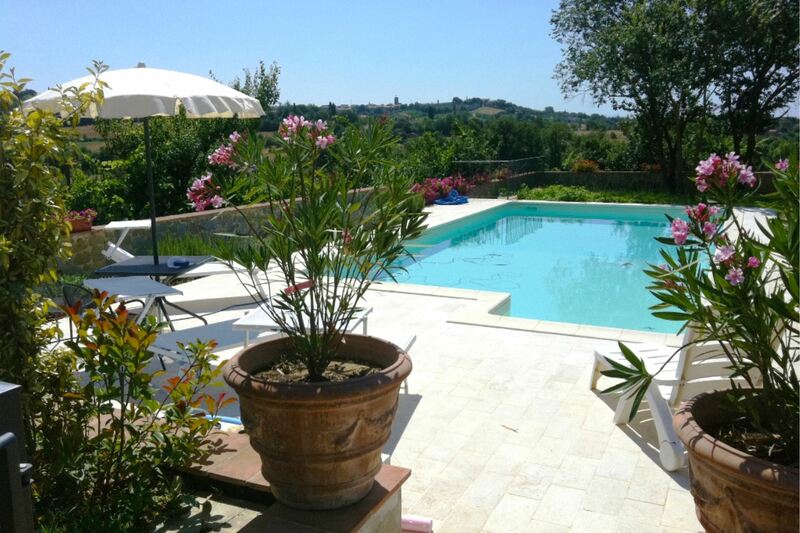 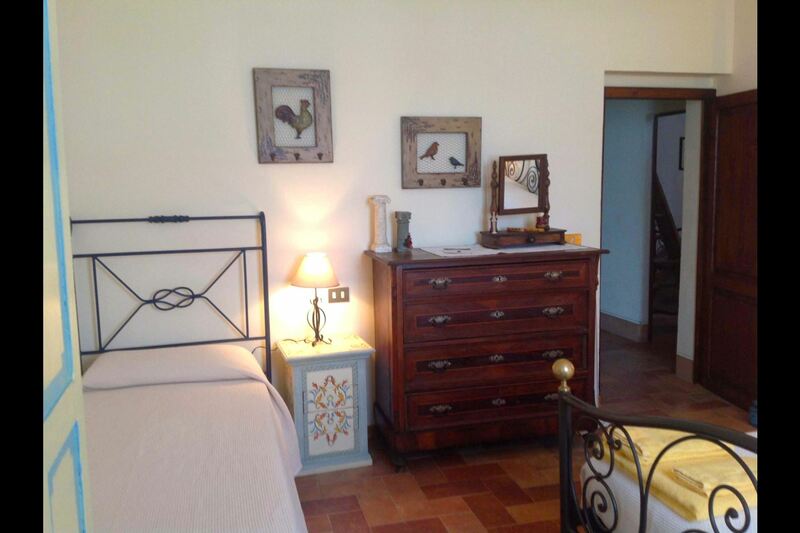 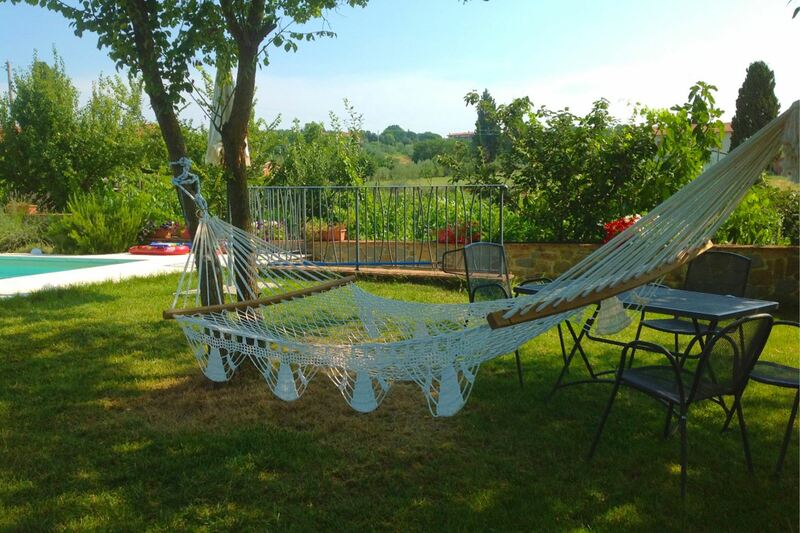 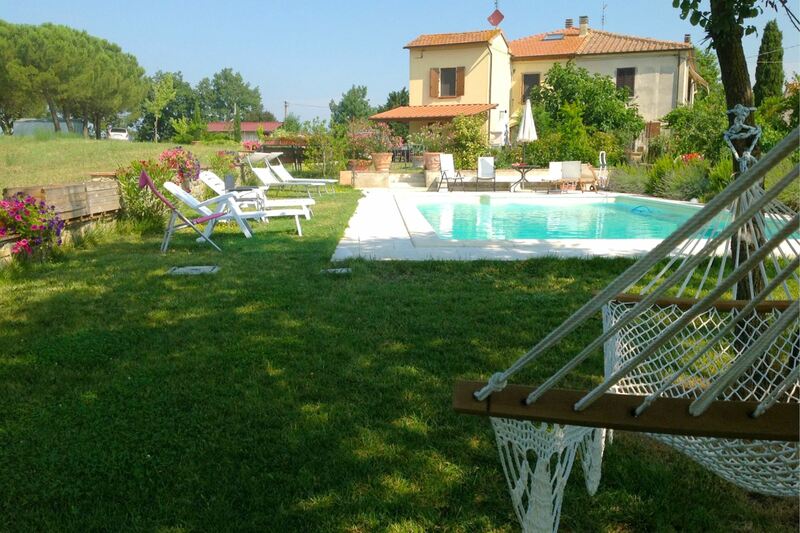 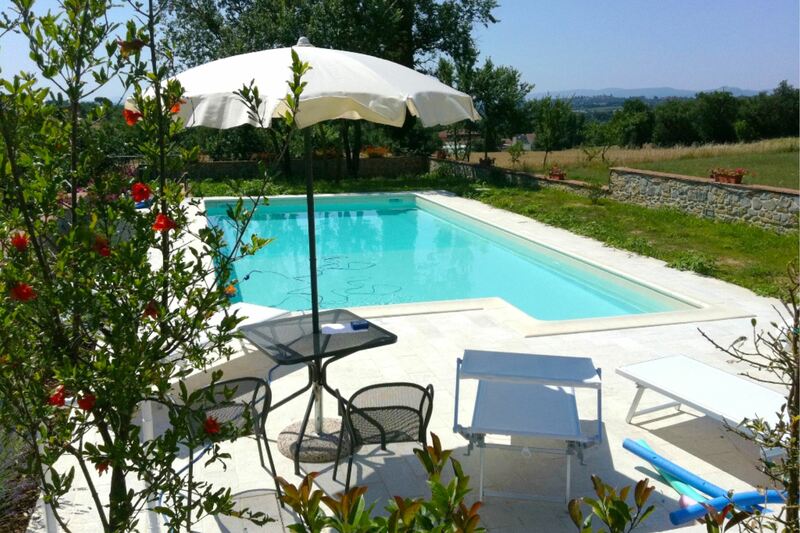 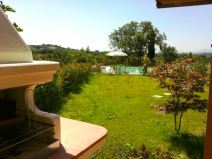 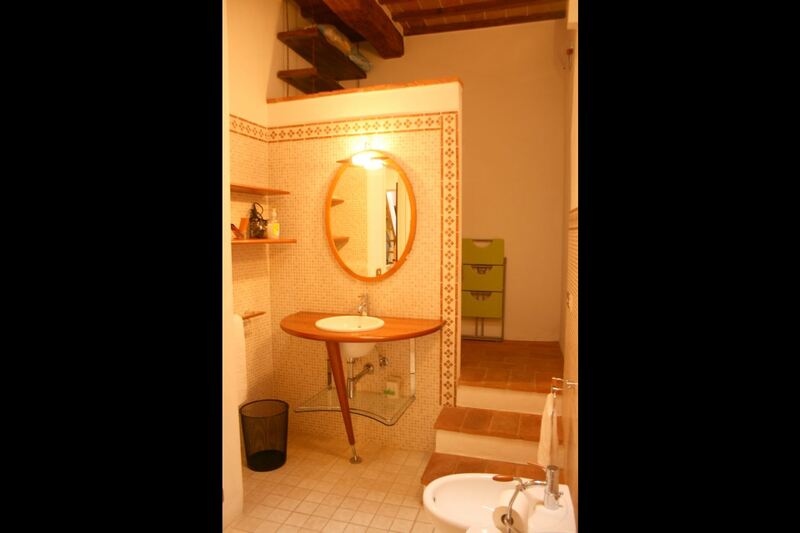 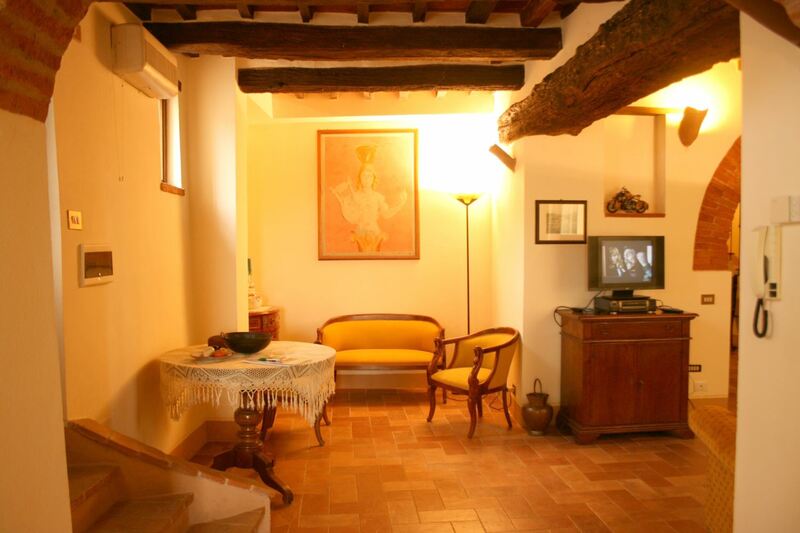 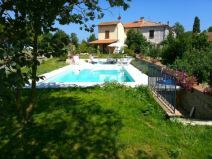 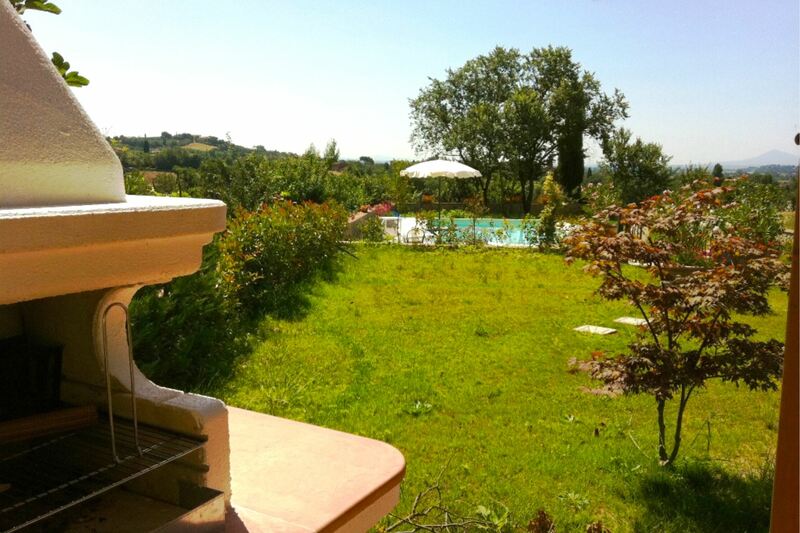 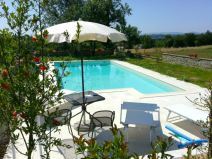 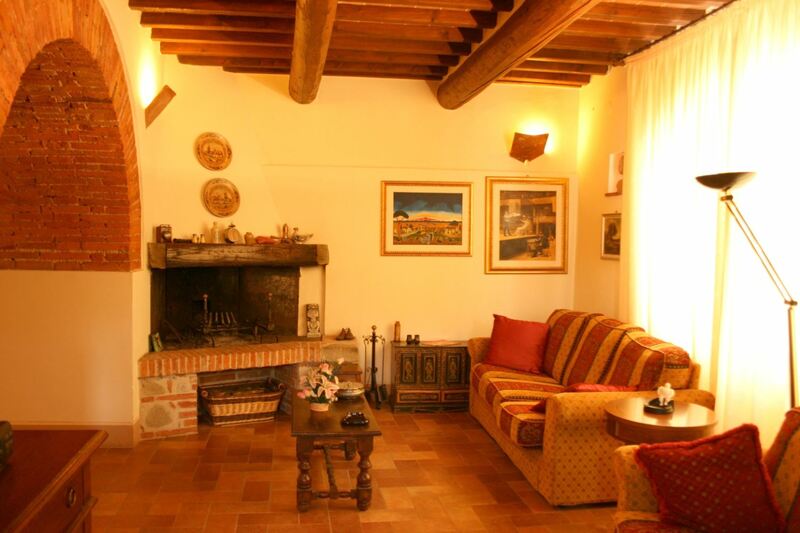 Located between Arezzo and Siena, just 2 km from Foiano della Chiana. 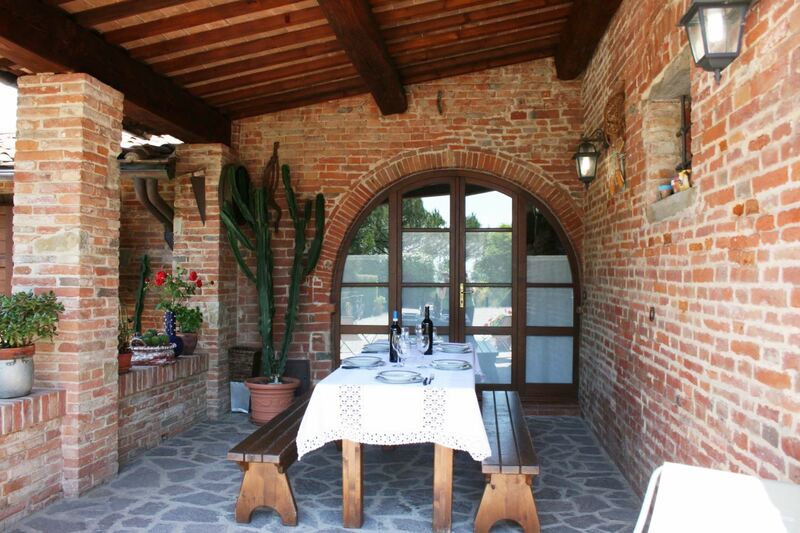 Old farmhouse in typical Tuscan style. 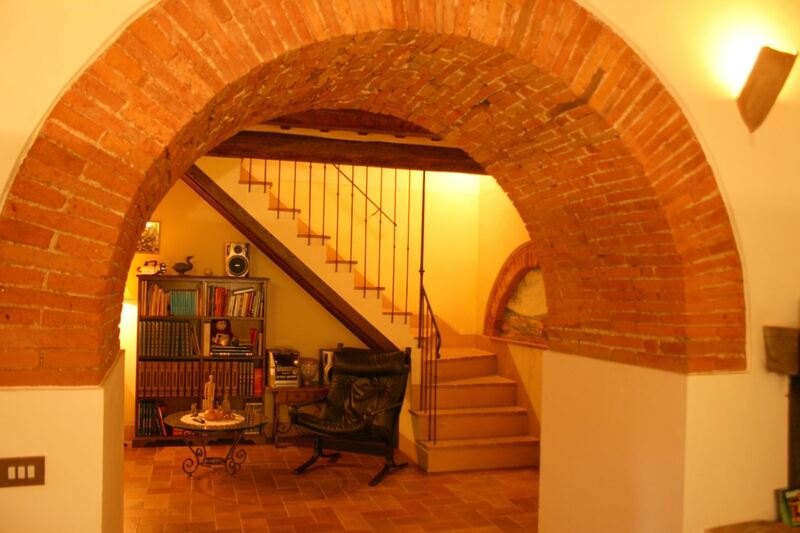 Part of an old farmhouse with characterful ceilings with wooden beams and red brick arches, situated on a sweet hill. 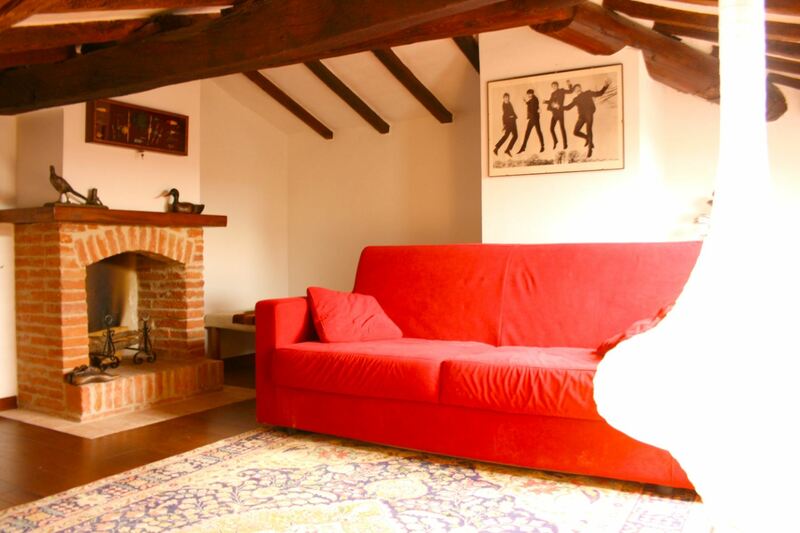 The house takes its name from the ancient river 'Clanis', which crossed the Valdichiana. 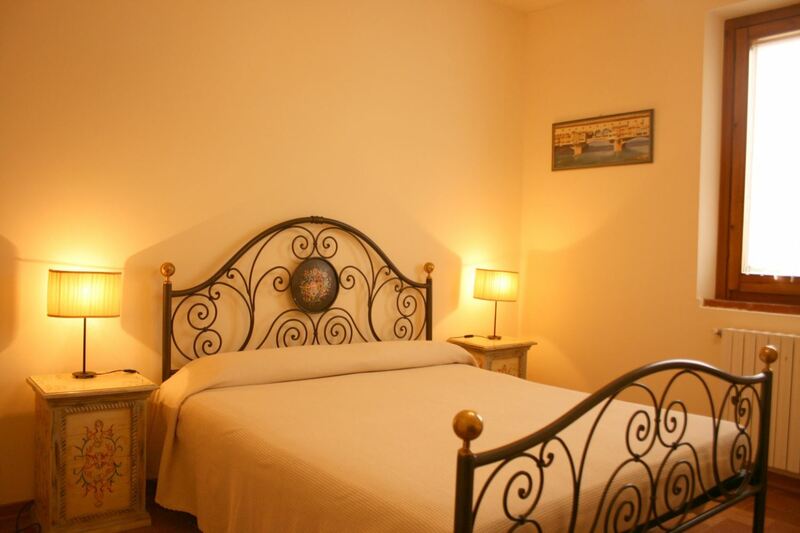 During the Roman Empire the river had to be dammed since its water range often caused flooding to the city of Rome. 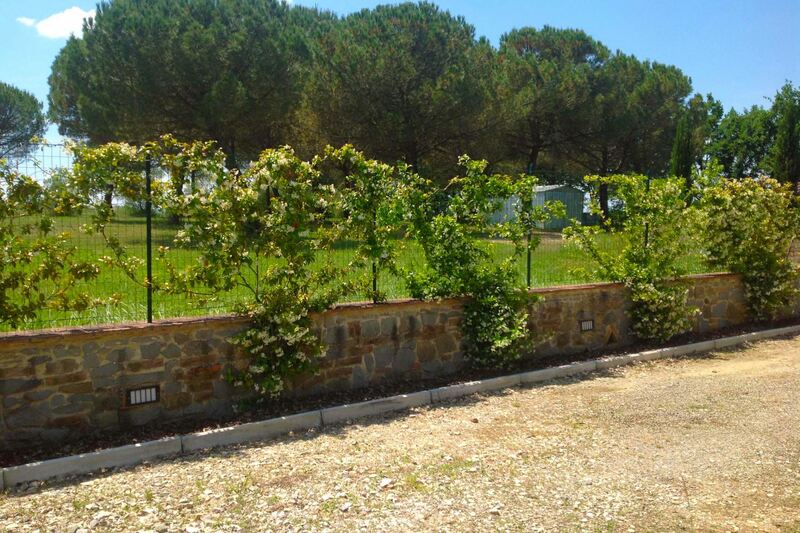 This dyke led the Valdichiana to become a marshland which was then reclaimed during 1700 by Vittorio Fossombroni and is today a fertile valley, rich in cultivated fields, vineyards and olive groves. 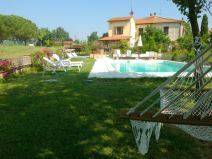 The nearby village of Foiano della Chiana. 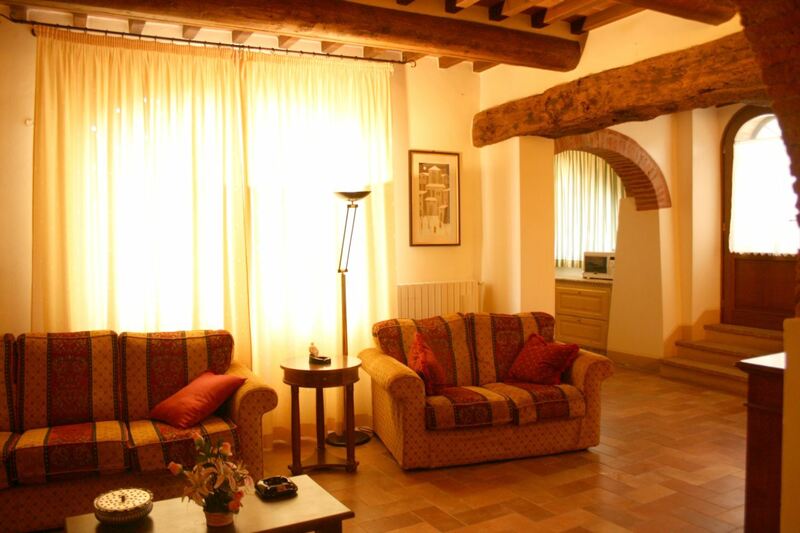 The village of Foiano della Chiana, endowed with every kind of service and shops, is only 2 km far from the house. 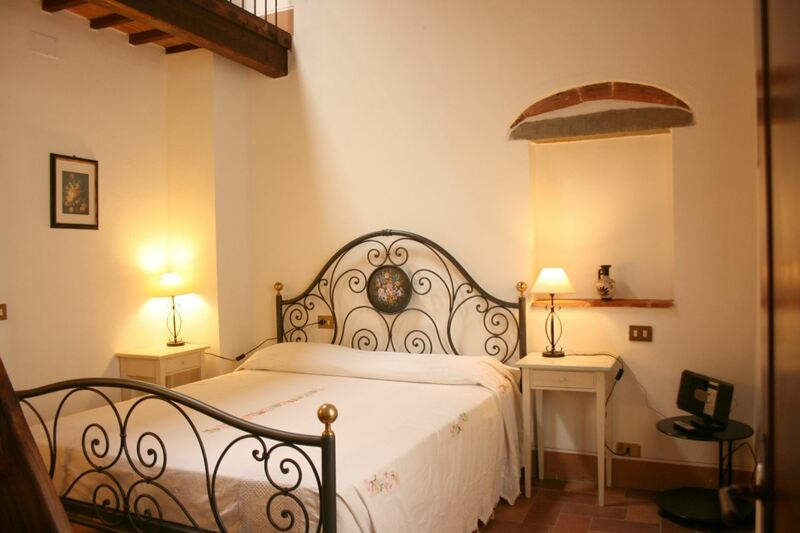 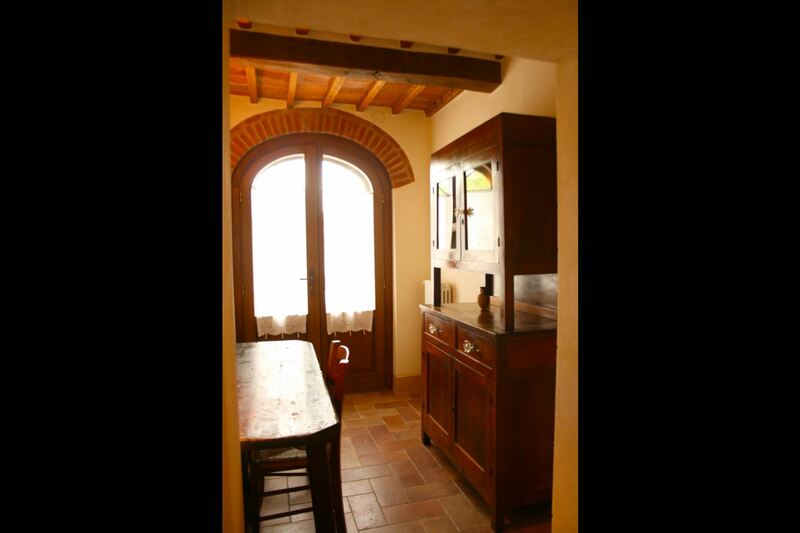 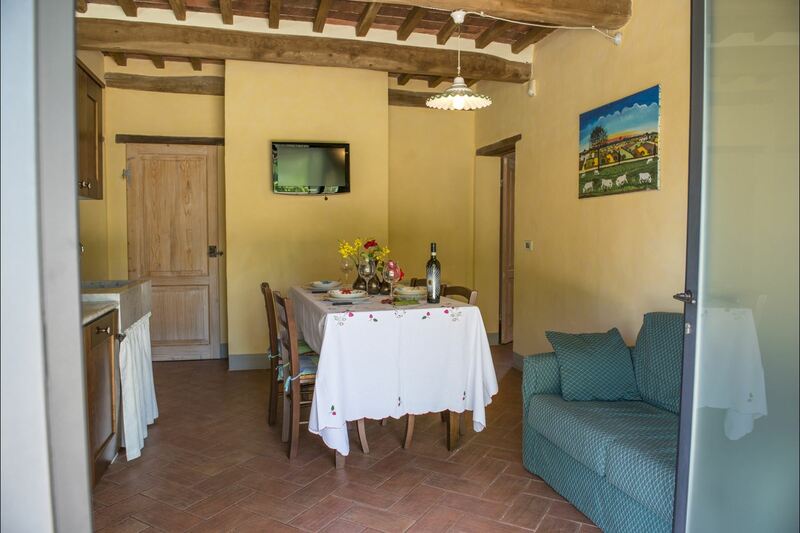 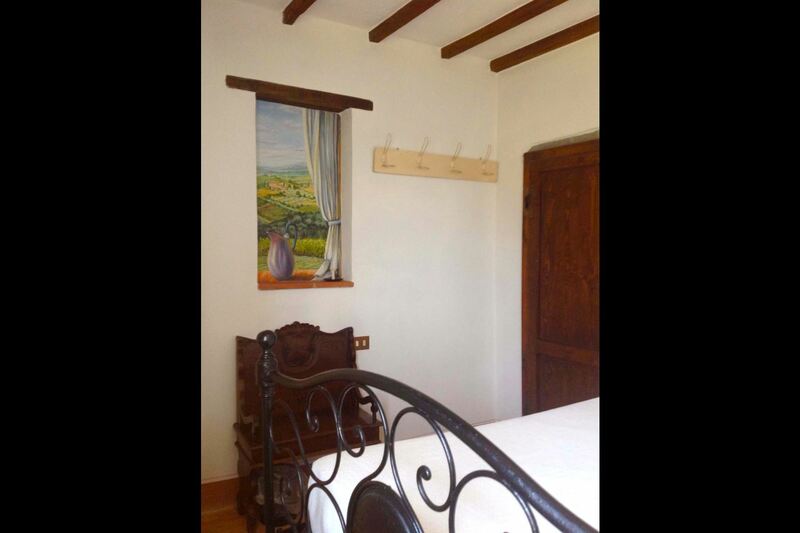 Casa Clanis is furnished in the typical Tuscan style, which perfectly fits in with the house building characteristics. 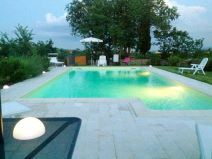 Pool and outdoor spaces. 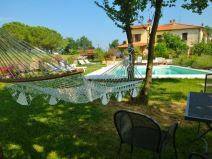 At guests' disposal and for their exclusive use a lovely swimming pool (size m. 5x10 - depth m. 1,20-1,50), a porch equipped with table and chairs to eat outside, a barbecue and a table football. 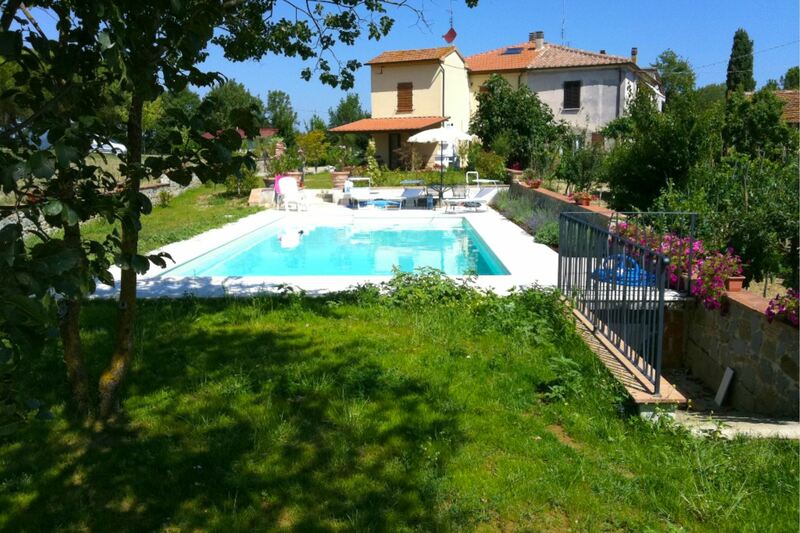 GROUND FLOOR: with entrance through the porch equipped with table, chairs, barbecue and table football, (descending 3 steps) kitchen-dining room, wide sitting room with fireplace and sofas, laundry room and wc. 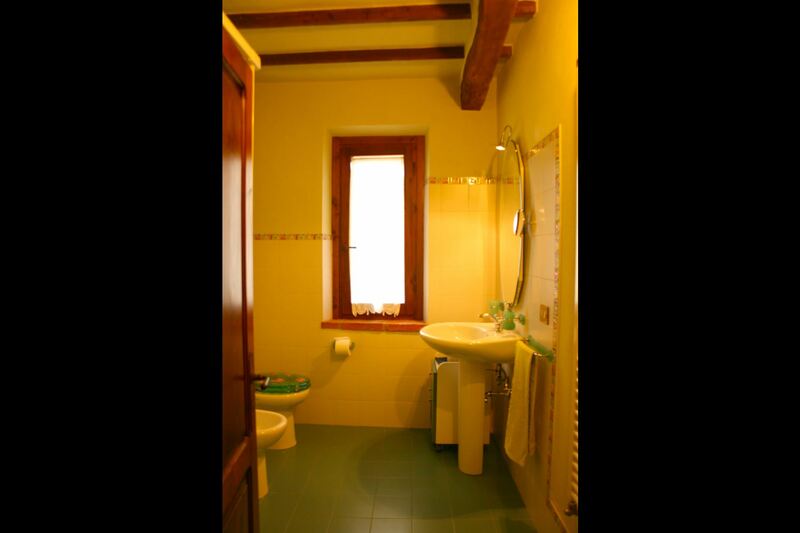 FIRST FLOOR: with access either through internal or external staircase, small study, bedroom with French bed, bathroom with shower, double bedroom with added single bed, double bedroom with wardrobe and private bathroom with hydro massage shower. 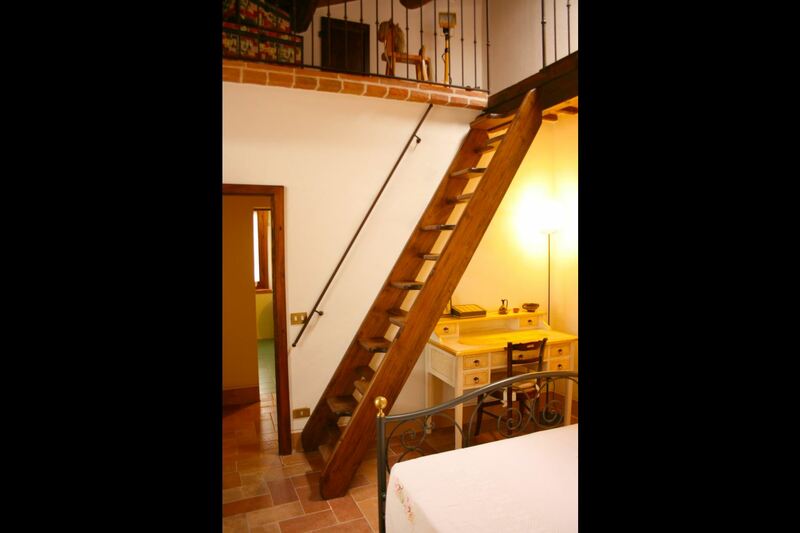 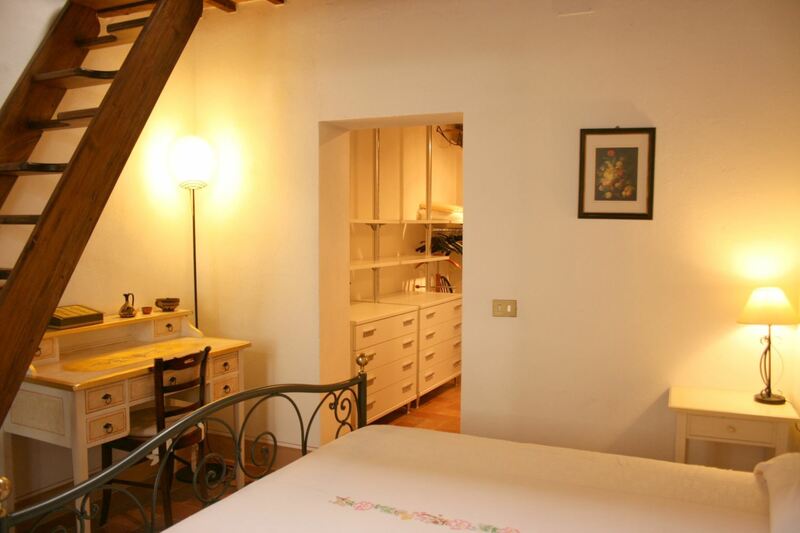 From this bedroom, going up a small wooden staircase you reach the attic with double sofa bed and fireplace. 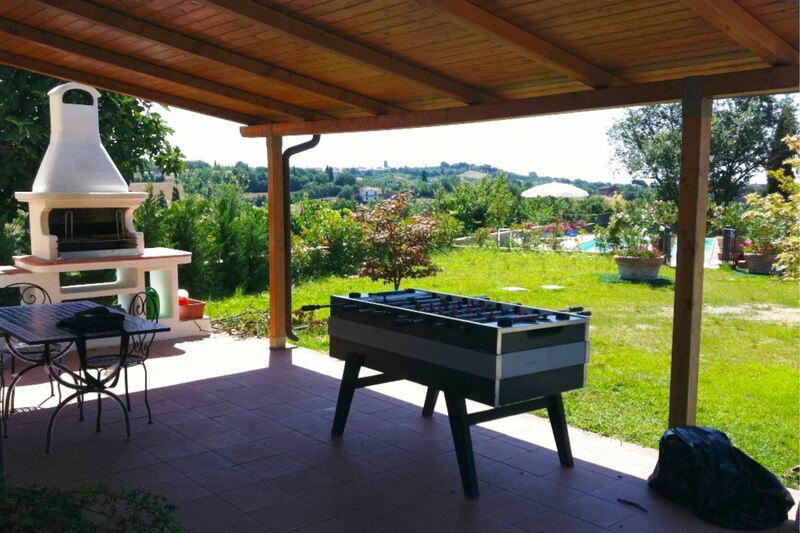 EQUIPMENT: satellite TV, washing machine, dishwasher, oven, microwave, filter coffee maker, iron and ironing board, Wi Fi Internet access, CD player, barbecue, table football. 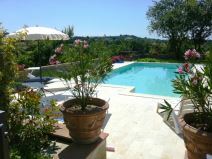 Private pool open from 04/05 to 24/08. 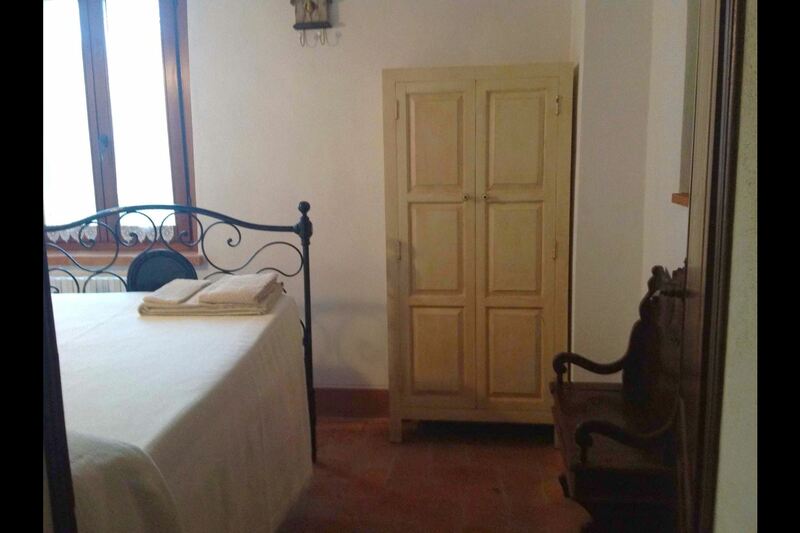 Baby bed (children up to 3 years) on request at time of booking. 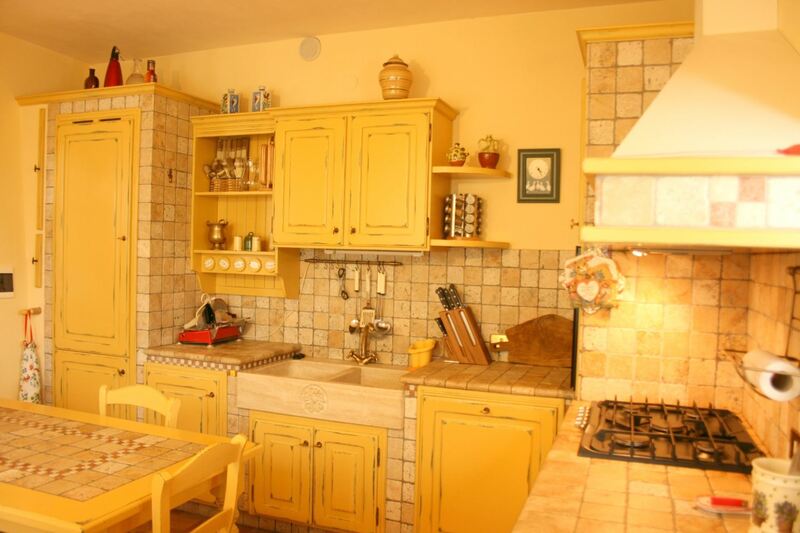 Obligatory final cleaning Euro 90. 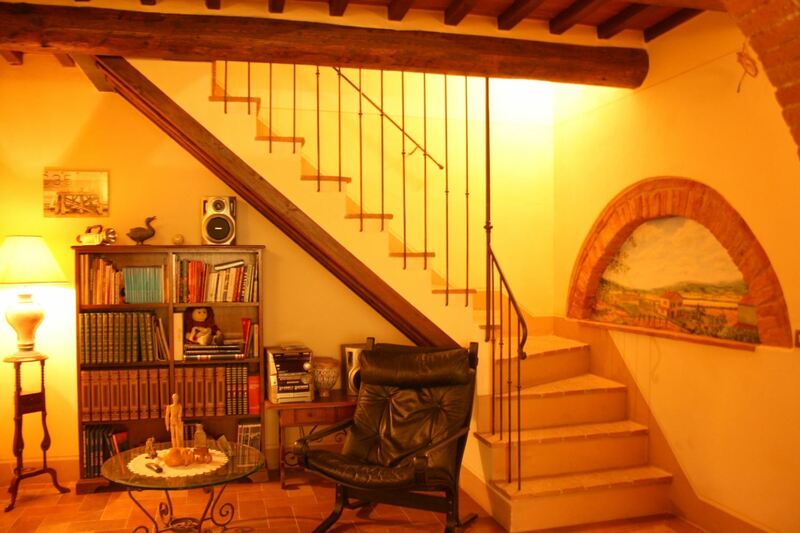 Wi-Fi Internet access Euro 10 per week. 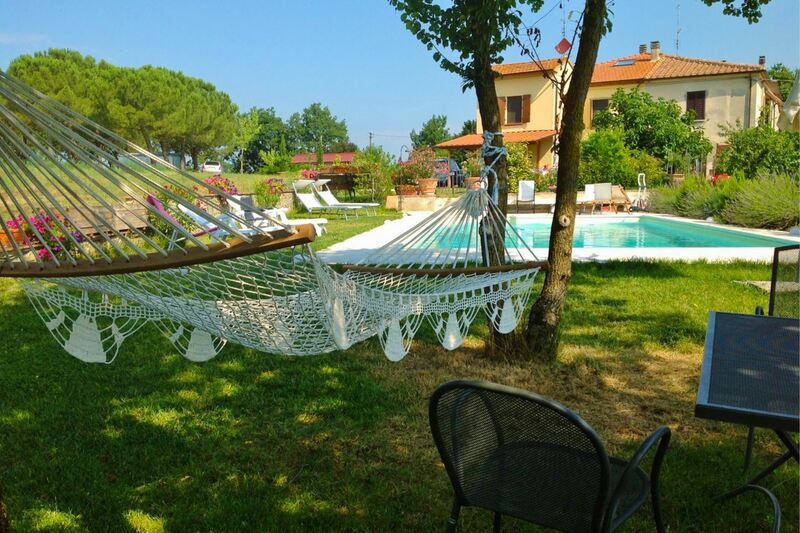 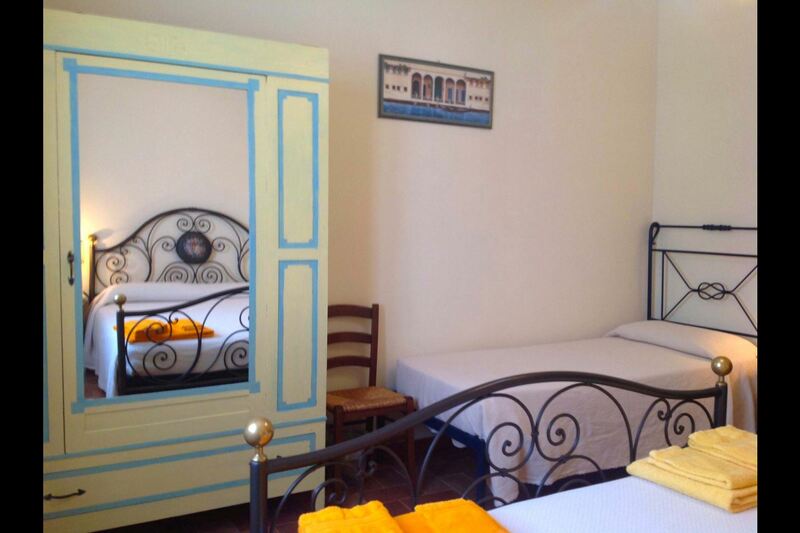 Perfect for a relaxing holiday and a great location for exploring Tuscany's many treasures. 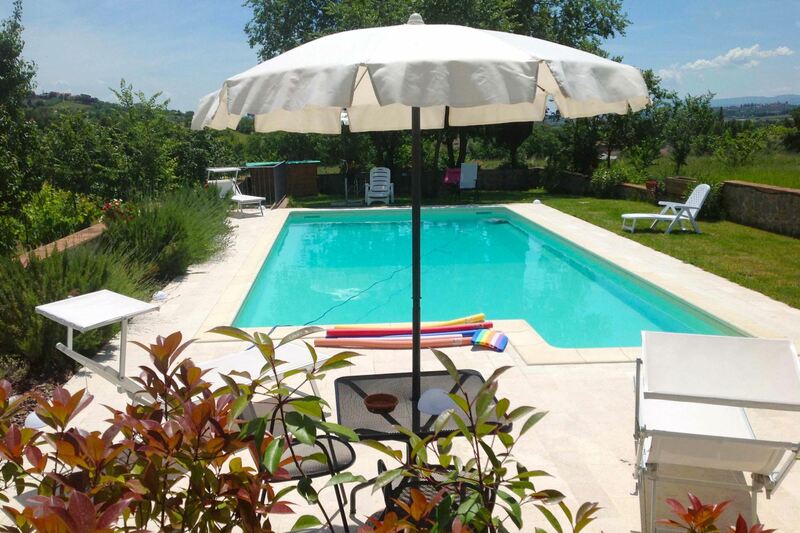 We've booked again for next year! 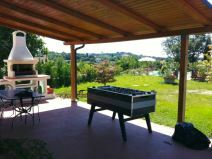 Thanks Guido and Ivana you are wonderful hosts. 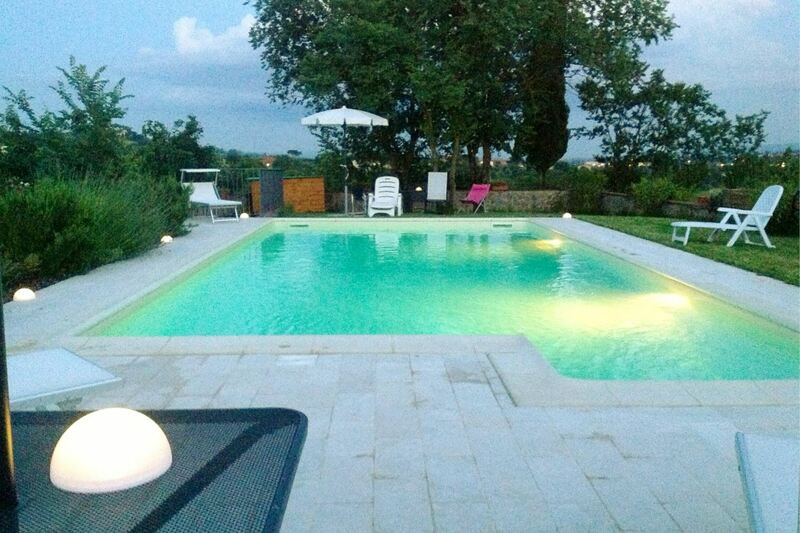 Das perfekte Haus mit einem wunderschönen Pool für einen entspannten Urlaub.